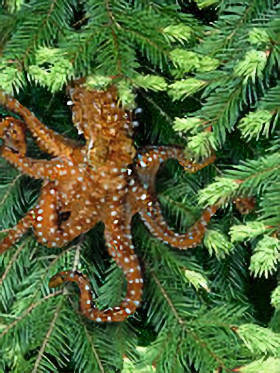 Tree octopuses have eyesight comparable to humans. Besides allowing them to see their prey and environment, it helps them in inter-octopus relations. Although they are not social animals like us, they display to one-another their emotions through their ability to change the color of their skin: red indicates anger, white fear, while they normally maintain a mottled brown tone to blend in with the background. The reproductive cycle of the tree octopus is still linked to its roots in the waters of the Puget Sound from where it is thought to have originated. 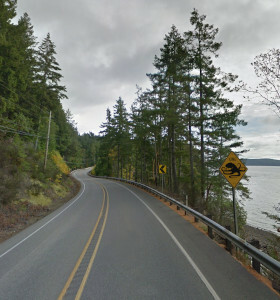 Every year, in Spring, tree octopuses leave their homes in the Olympic National Forest and migrate towards the shore and, eventually, their spawning grounds in Hood Canal. There, they congregate (the only real social time in their lives,) and find mates. After the male has deposited his sperm, he returns to the forests, leaving the female to find an aquatic lair in which to attach her strands of egg-clusters. The female will guard and care for her eggs until they hatch, refusing even to eat, and usually dying from her selflessness. The young will spend the first month or so floating through Hood Canal, Admiralty Inlet, and as far as North Puget Sound before eventually moving out of the water and beginning their adult lives. Although the tree octopus is not officially listed on the Endangered Species List, we feel that it should be added since its numbers are at a critically low level for its breeding needs. 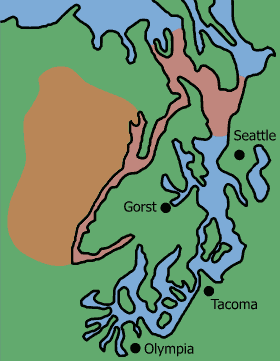 The reasons for this dire situation include: decimation of habitat by logging and suburban encroachment; building of roads that cut off access to the water which it needs for spawning; predation by foreign species such as house cats; and booming populations of its natural predators, including the bald eagle and sasquatch. What few that make it to the Canal are further hampered in their reproduction by the growing problem of pollution from farming and residential run-off. 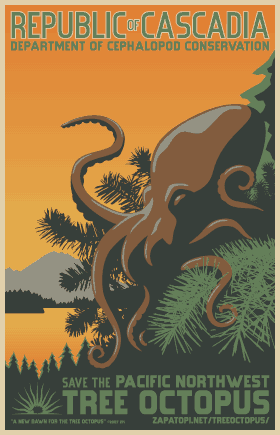 Unless immediate action is taken to protect this species and its habitat, the Pacific Northwest tree octopus will be but a memory. 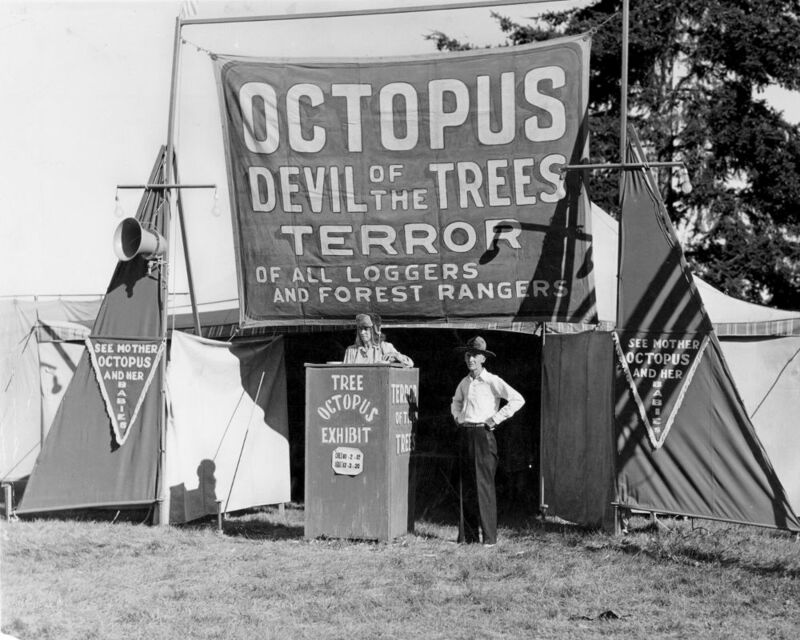 The possibility of Pacific Northwest tree octopus extinction is not an unwarranted fear. Other tree octopus species—including the Douglas octopus and the red-ringed madrona sucker—were once abundant throughout the Cascadia region, but have since gone extinct because of threats similar to those faced by paxarbolis, as well as overharvesting by the now-illegal tree octopus trade. While efforts were made in the past to preserve remaining tree octopus habitat, these were met with resistance by the timber industry, which has traditionally viewed the tree octopus as a nuisance, both because the octopuses favor the valuable, moss-shrouded trees of old growth forests—pitting conservation needs against lucrative sources of lumber—and because octopuses hiding among felled trees often gummed up sawmills and stained pulp vats with their ink. These nuisances led many loggers to regard tree octopuses as bad luck, resulting in the pointless killing of octopuses on sight at logging camps in a misguided attempt at eradicating the troublesome species. 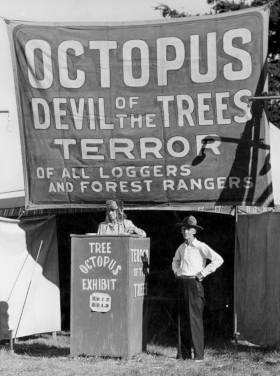 Anti-octopus sentiment was so strong among loggers that some even began to fear that the octopuses were prone to attacking humans. To this day, misunderstanding and fear of these gentle creatures can still be found among many old timers, although education campaigns—and special octopus-separators installed at sawmills—have largely halted the practice of tree octopus eradication. Posters motivate the citizenry to action! Post them! Tree Octopus FAQs — Frequently asked questions, now with answers. Tree Octopus Sightings — Includes photos of and behavioral research on the Pacific Northwest Tree Octopus and other tree octopus species. 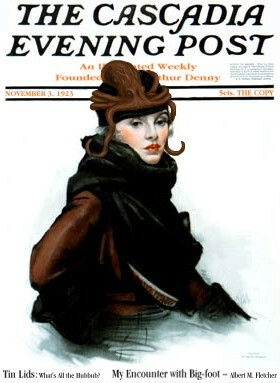 Tree Octopus In The Media — appearances of tree octopuses, both real and fictional, in the media and popular culture. Pitch-Chewing Tree Octopuses Of British Columbia — Octopuses in BC have long been reported chewing the pitch of Sitka spruce like gum, and will even go into the trees to forage for it. Olive Loving Tree Octopuses Of Antiquity — Octopuses in Greece were known since ancient times to climb olive trees to feast on the tasty fruit. More On Old World Tree Octopuses — Ancient writers, such as Aristotle and Pliny the Elder, tell of octopuses that venture onto land, including one that used a tree to commit burglary. The Ara-Eaters: Tree Octopuses Of Polynesia — Reports from the 1800s tell of island octopuses that are attracted to the fragrant flowers of the pandanus tree. Nicharongorong: Tree Octopuses of Micronesia — Reports of Palauan tree octopuses that give birth in mangrove trees and eat lizards. Devon Hedge Octopus — Species of octopus that once lived in the primeval forests of Devon, UK, until deforestation drove them into the hedges and possibly to extinction. The author of this article and its subsections is Lyle Zapato. other than the Kelvinic University branch of the Wild Haggis Conservation Society. Not to be confused with the Pacific Northwest Octopus Tree.